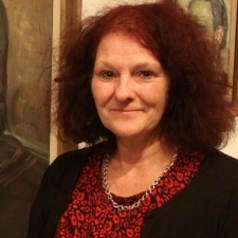 Fran Lloyd is Professor of Art History, Director of the Visual & Material Culture Research Centre and Associate Dean for Research and Enterprise in the Faculty of Art, Design & Architecture. Fran has published widely on contemporary and modern visual culture, and has over 15 years experience of collaborating on a variety of international interdisciplinary creative arts projects across the museums and galleries sector. A recent DAAD Fellow and Japan Foundation Fellow, her research has been funded by the Arts and Humanities Research Council, and the British Council, amongst others. She is currently researching émigré artists in postwar Britain and is co-leading a research project on the history, practice and pedagogy of Kingston School of Art, London, funded by the Henry Moore Foundation.